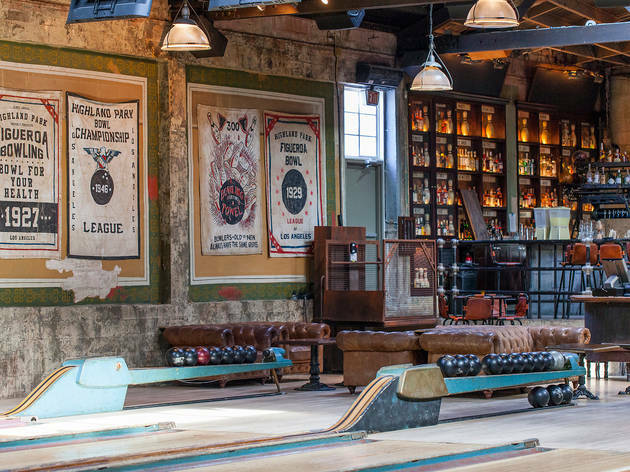 The cultivated saloon inside LA’s oldest bowling alley has character to spare. This is a tale of two years: 1927 and 1933. 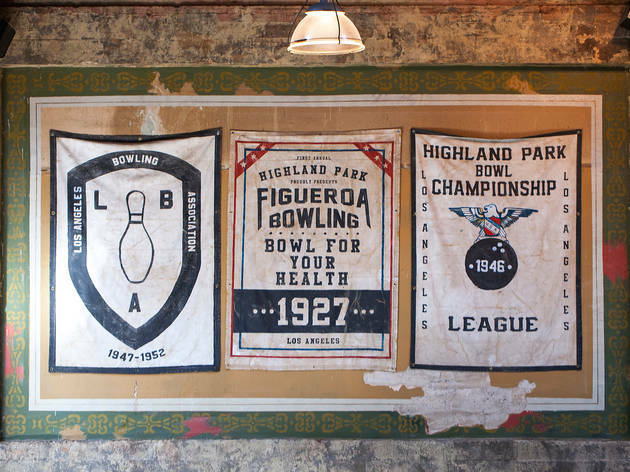 The former is when LA opened one of its first bowling alleys, Highland Park Bowl, on Pasadena Avenue (now Figueroa Street), which closed under a different name in 2014. 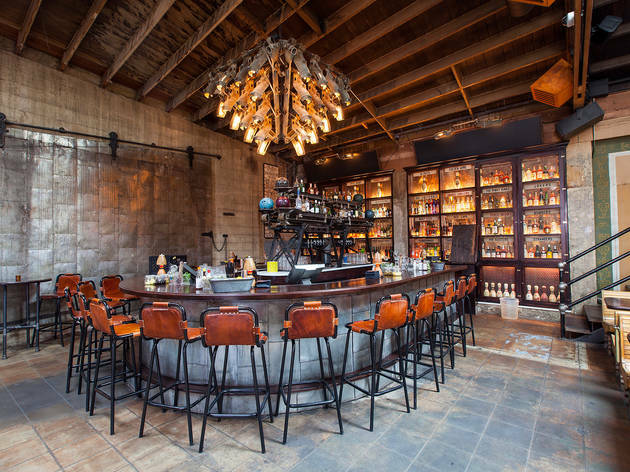 The latter refers to three young 21st century businessmen (The 1933 Group) working their way through LA’s up-and-coming neighborhoods, transforming run-down watering holes into venues that radiate class and style (Sassafras, Harlowe). 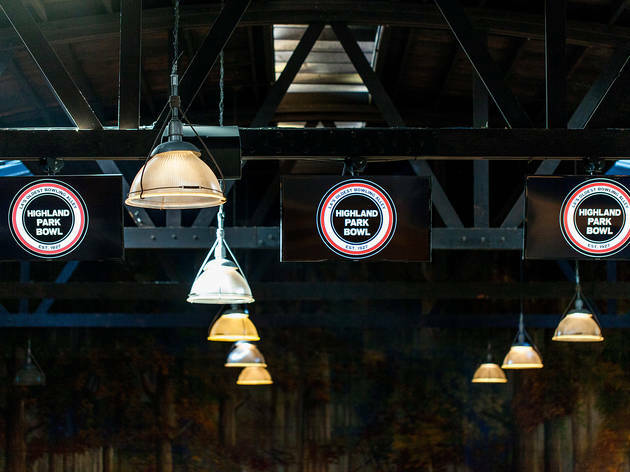 When the group renovated and reopened Highland Park Bowl in April 2016, they unveiled a spectacle. Past the entrance, the 15-step portico breathes like an old hotel. 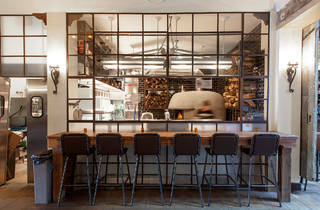 Through a window on the left is a busy kitchen and a huge, Italian, wood-burning oven. 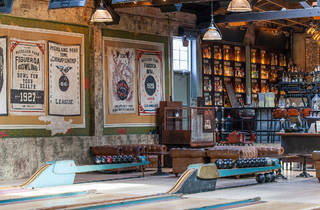 The hallway opens to the spacious main room where you’re sent a century back in time and dazzled by eight bowling lanes set in a swanky saloon. 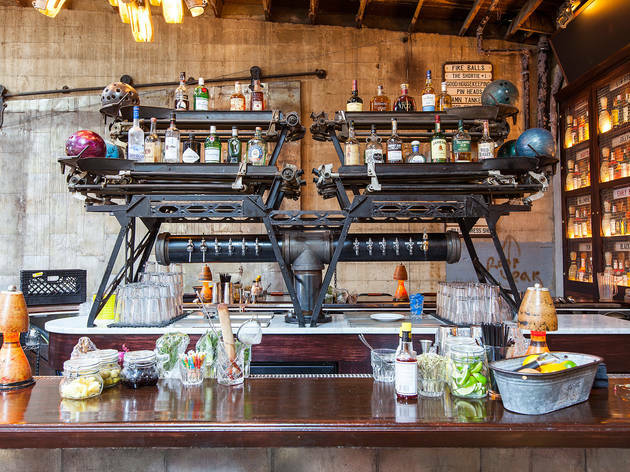 Overhead, massive chandeliers made from refurbished, 100-year-old pinsetters light up two horseshoe bars. 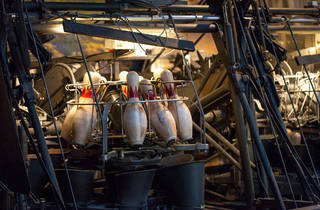 Once seated, you can marvel at the wizardry of steampunk machines recycling pins at the end of each lane. 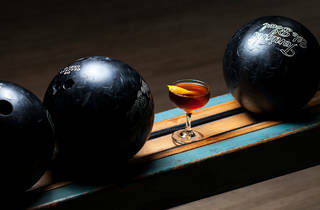 Soon you realize bowling is just an accessory to a bar scene revolving around the eight-drink cocktail menu. 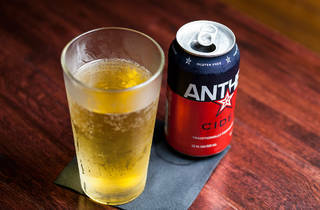 Each is an original recipe (save for a Moscow Mule with housemade ginger beer). 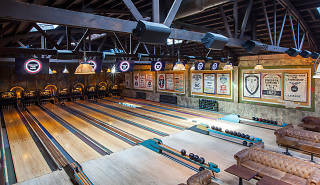 The rest are re-imaginings of old classics with names inspired by Kingpin, The Big Lebowski and Throw Mama from the Train (filmed here in 1987). 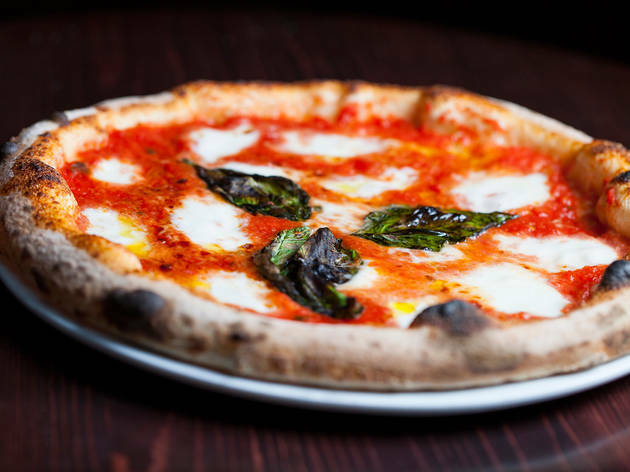 The pride of the kitchen is the Neapolitan-style pizza, which skirts grease in favor of abundant, fresh ingredients. Early in the night, groups of Highland Parkers congregate around each bar before the area between them fills in and the two sides unite. 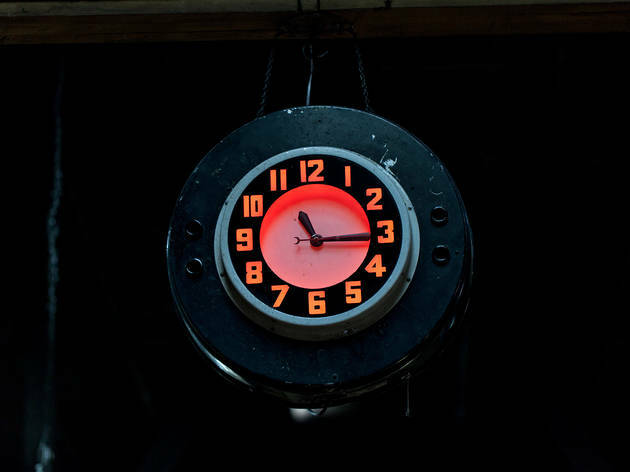 The 1933 Group’s newest project joins ETA, Civil Coffee and a few more bars and restaurants in fast-tracking the revitalization of this historical LA neighborhood. The scene: Lively but controlled, erudite but unpretentious. 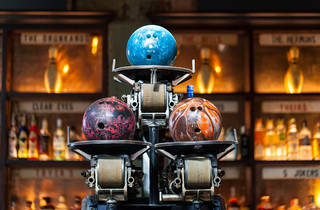 The crashing of bowling pins doesn’t disrupt chats over whiskey with bartenders, friends and strangers. 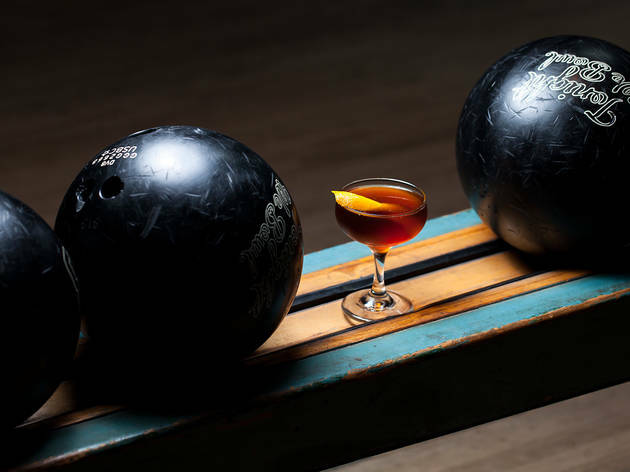 For half the crowd, the bowling is a conversation piece between drinks, like a minor league baseball game. 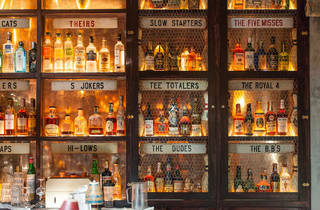 Good for: It’s perfect for a casual date or drinks after work if you prefer inventive cocktails and a (short but) strong beer list. 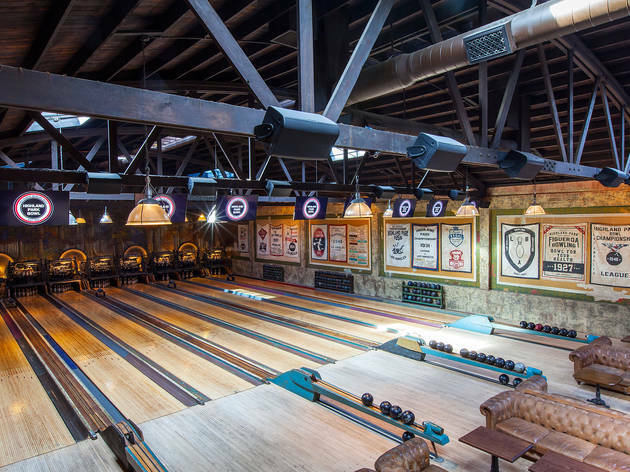 For a breather, lead your date by the hand to two levels of intimate seating and prime bowling viewage to the left of lane #1. 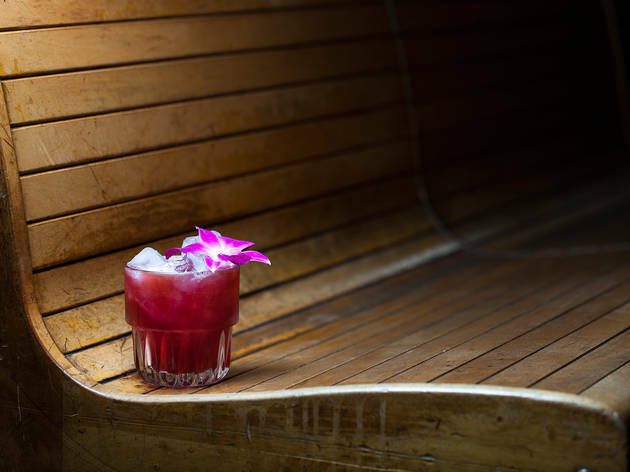 Drink this: Innovative cocktails take classics and bump the sweetness and drinkability up a notch. 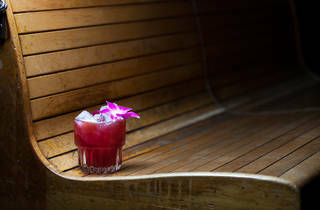 Mr. Munson’s Neighborhood ($12) cuts half the bite out of an old-fashioned but adds Aztec chocolate bitters for a welcome surprise. The Dude Abides ($12) modifies Jeff Bridges’ classic White Russian with horchata cream and a cinnamon tincture that really tie the drink together. Ten draft beers feature local favorites (Golden Road and Firestone) accompanied by Anthem cider in a can and Not Your Father’s Root Beer in a bottle. 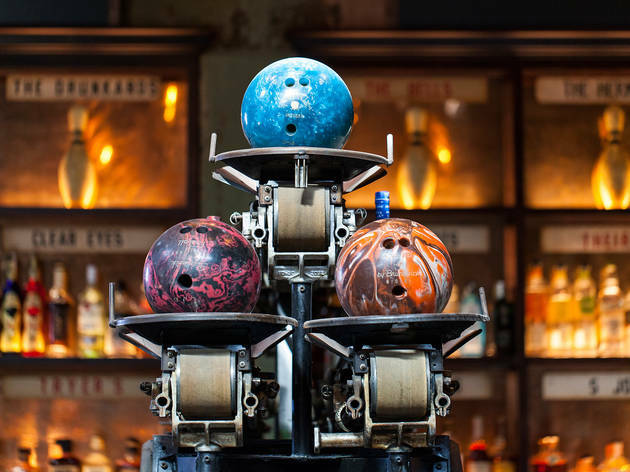 Our Tip: Start bowling between 5pm and 8pm to dodge the $10 rate hike, then move to the bar for drinks and dinner. 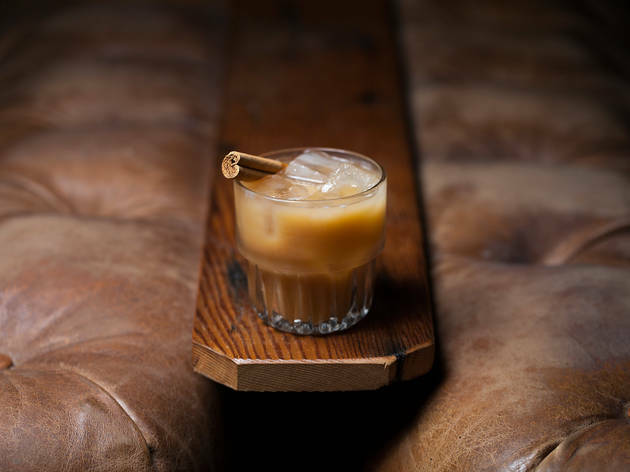 Hold on to your spot at the bar to use as a base for when the room fills up. 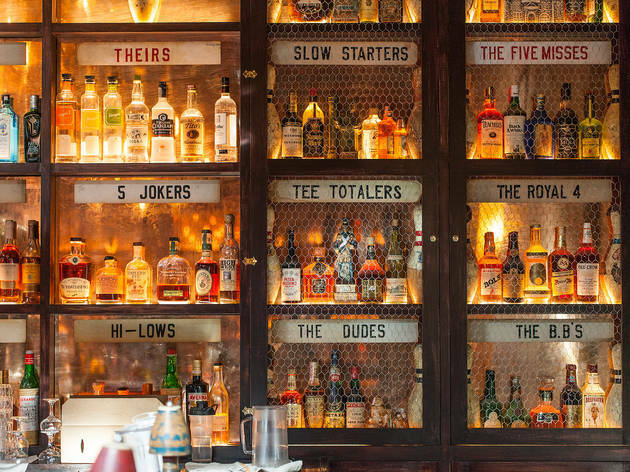 Close your tabs regularly as drinks at the bar, drinks in the lanes and the lanes themselves are all tallied on separate bills. 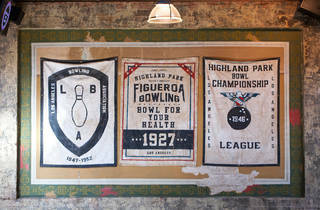 One of the very heavily talked about and photographed re-openings of this year has been the Highland Park Bowl, a very vintage bowling alley that has had a couple iterations since the 1920's. I've been wanting to go but heard it was quite small and assumed its location in trendy Highland Park would lead to large crowds. A friend had an excellent idea to visit on a Saturday morning right after it opened. It was not too crowded, and completely bright and clean. The staff welcomed us in every area. 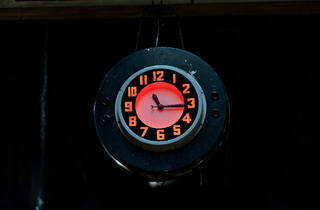 I love retro style and this place feels like you've stepped back in time. It almost feels like a period movie set. The bowling alley provides bowling lanes, of course, but also a food menu with wood burning pizza made to order, brunch, cocktails and plenty of seating. Some nights they even have karaoke and other themed activities. Our hour at the lanes just flew by, but we opted to stay longer to enjoy another drink and a pizza. 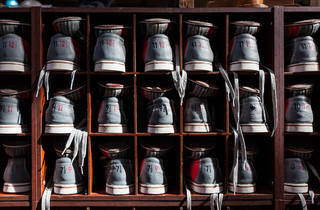 The bowling fees and shoe rental tabs are separate from the bar and food tab, and they do a good job serving you regardless of what section you choose to inhabit. 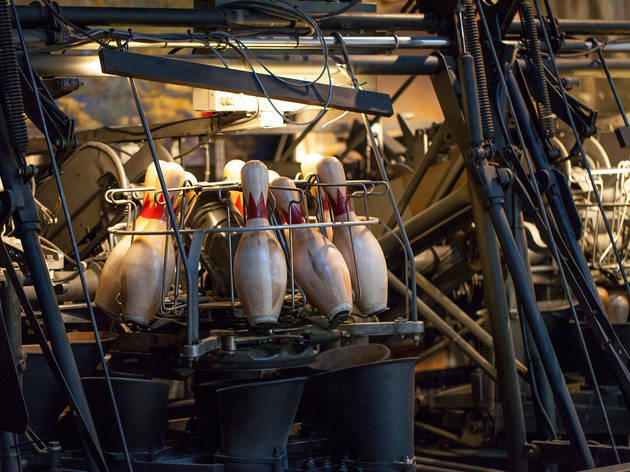 For me, just watching the antique machinery that sets the pins and returns the bowling balls provided ample entertainment. They have just the right amount of technology with plasma screens tallying the players and scores electronically. 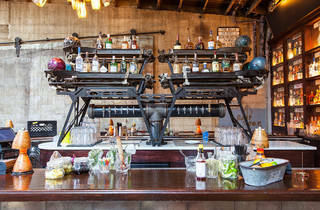 All this fun can get a bit pricey, but the ambiance makes it a worthy splurge. This place feels a bit too much like an amusement park to me, and the drinks were nothing to write home about. 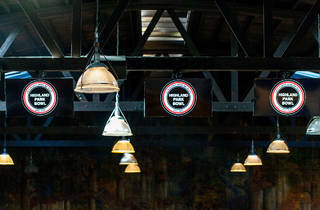 However, if you're looking for a dramatic setting for a date or night out with friends, this fits the bill. 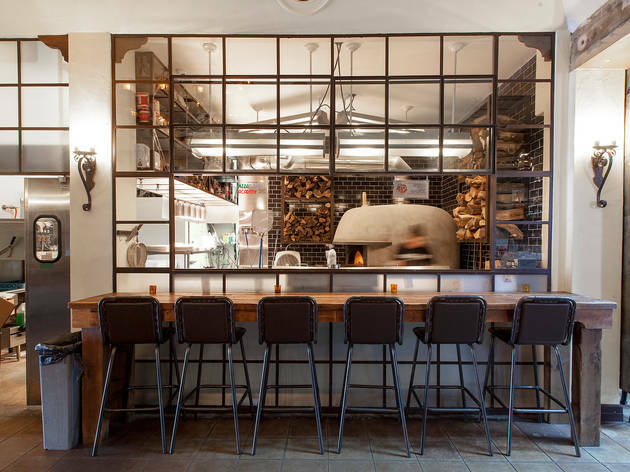 I haven't eaten here, but hear the pizzas are pretty delicious. And check out the amazing, huge mural on the back wall, restored after decades and decades! 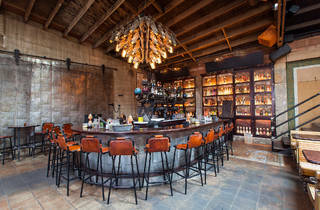 An utterly gorgeous space and attentive service make up for somewhat weak cocktails. Some of the best interior design in the greater Los Angeles area (it's of the same caliber as Clifton's in terms of mood, scope, and detail), it's an absolute delight to dine and/or drink here. 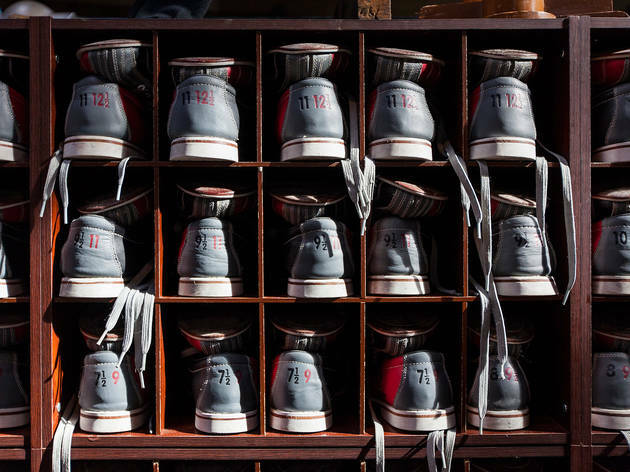 Bowling is expensive (for instance, $60 for an hour on a Friday) and can be busy depending on the night, but it's manageable if you have enough people. 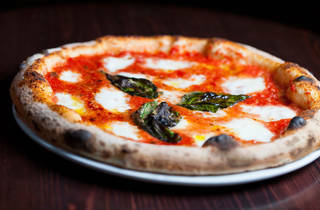 The food is casual but yummy--think pizza and other bar bites, like delicious fries. There's a good beer selection and numerous interesting cocktails. That said, I had two, and while they both tasted good, they also seemed quite light on the alcohol content. All in all, this is a fantastic place for a night out whether you're catching up with friends and feeling like a casual (but awesome) evening or getting dressed up a bit and going out for a date.